Replace your cord plugs with the PowerGrip™ replacement plug with handle for ease of use. Give your existing electrical cables the convenience and ease of our popular Power Grip™ accessories. Power Grip’s solid construction and sturdy handle allow for easy handling and better grip while plugging and unplugging electric cords. Round ground compatible with older style receptacles. 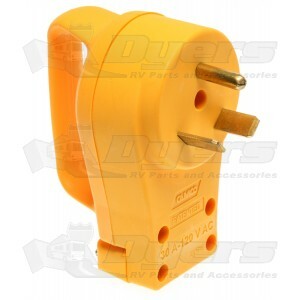 Plugs into a 30A receptacle. Great product, easy to install, great service!! Installed easily, good and solid. Got product in 2 days!